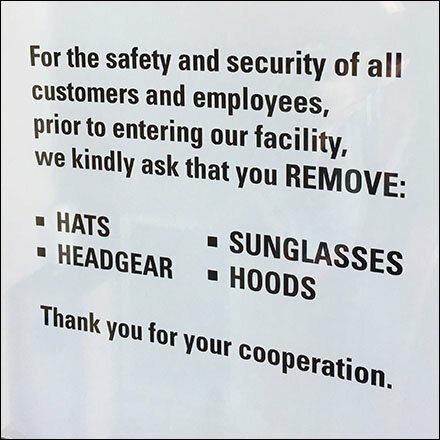 Though seen at a branch bank location, I am sure Convenience and other retail channels would love to implement this No Disguises Permitted and similar policies to ward off robberies, fraud, shoplifters and others who seek anonymity in-store. As customer I do not mind the message as a request of me, but it does make me think I am in a second-class store location, and bad neighborhood regardless of how good both may look. How about a more positive approach such as ID may be required? That hints that who you are and how you look might be challenged.